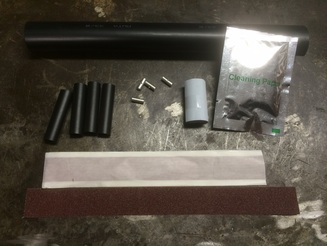 Contents of submersible pump cable splice kit. 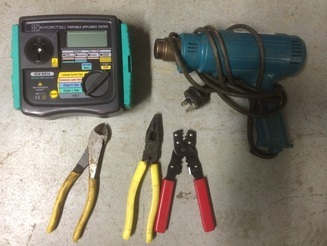 Tools require to cut, crimp, heat and test completed cable splice. 1. Strip back about 25mm of the black insulation from the submersible drop cable and strip back 10mm of insulation off of each conductor. Strip back about 80mm of the blue insulation off the motor cable and strip 10mm of insulation off the conductor. Slide large heat shrink on to cable. Crimp one end of crimp connector to each conductor. Slide small heatshrink on to each conductor. 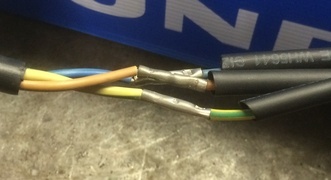 Crimp connector to matching conductor of other cable. 2. Heat with heat gun starting from one end of heatshrink. All of the heat shrinks normally shrink at the same time. Key the about 50mm of the outer black and blue insulator with the sand paper from the kit. This process takes the shine off the rubber and allows the sealing tapes and heatshrink to bond. Do not key the rubber along the length of cables. 3. Wrap the sticky red flat putty around each end of the cable ends. Squeeze putty to fill the gaps. 4. Wrap the black sealing tape around the joint from one end to the other. Squeeze gently to fill all the gaps. Slide the large heatshrink over the wrapped joint. Ensure the keyed area extends beyond the heatshrink each end. If not slide the heatshrink back and extend the keyed area. 5. Hold the cable vertical and heat the heatshrink from the center upwards to the top, then invert it and heat the heatshrink to the top again. This process will expel the air bubbles and extrude a some of the resin beyond the end. Allow to cool straight if possible. 6. 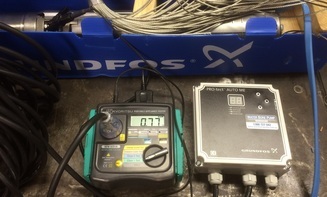 Test the completed cable splice joint with a multi-meter or appliance tester. 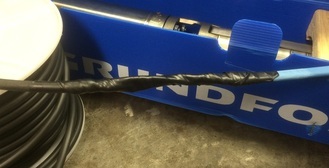 The earth pin should have a low resistance to the body of the pump ensuring the earth connections are correct. The other conductors should have a high resistance to earth. The resistance between the conductors will show the resistance of the motor windings. 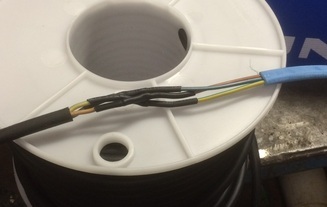 Lorentz submersible pump cable splice connections. 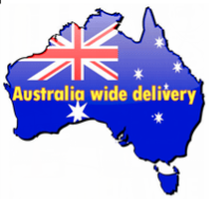 If you purchase the pump and cable from Water Bore Pump Warehouse we can supply it spliced and tested ready for installation. 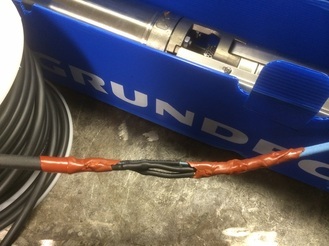 The use of the wrong cable may damage your pump drive motor and void the warranty.